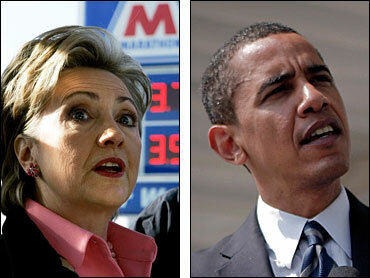 Dueling over gas prices, Hillary Rodham Clinton and Barack Obama strained for every last vote on Monday, the eve of the Indiana and North Carolina primaries that are the biggest prizes left in their epic Democratic nomination fight. Her TV ads promoted her plan for a summer-long gas-tax holiday and contended she was the candidate who "gets it." He said the plan was just another Washington stunt. A combined 187 delegates are at stake in the two states, nearly half of the pledged delegates left with eight primaries to go before voting ends in a month. In interviews with CBS Evening News anchor Katie Couric on the eve of the primaries, both candidates argued that they would be able to defeat presumptive Republican nominee John McCain in the general election. "I think that I can make a much stronger case that I go into the race against John McCain much better positioned to actually win in November," Clinton said. Obama said that electability was not the most important issue in the Democratic race, but that nonetheless, he would match up well against McCain. "This issue has come up lately because it's the only argument that Senator Clinton has for winning the nomination. But in fact we've won by substantial margins in places like Virginia, Iowa, Wisconsin. The polls indicate we can beat John McCain in all the swing states," he said. Obama was the favorite in North Carolina, but both candidates campaigned vigorously there with polls showing a tightening race since Clinton's win in Pennsylvania two weeks ago. Indiana was considered a tighter race, with most polls in the final days showing Clinton taking the lead. Top Clinton aides are confident that blue-collar white voters will provide the boost Clinton needs to win Indiana, reports CBS News chief White House correspondent Jim Axelrod. But Obama victories in both Indiana and North Carolina on Tuesday night could potentially end the confusion and end the race, reports CBS News correspondent Dean Reynolds. Obama hurried back and forth between the two states, pleading for votes. "I want your vote. I want it badly," he said on a factory floor in Durham, N.C., one of many stops aimed at winning over working class voters. He is hoping to gain support from a group that has not greeted his candidacy enthusiastically - white, mostly male construction and factory workers. Clinton, also campaigning in North Carolina, campaigned for blue-collar votes, too, talking about the hard times the country faces. "It's time to quit wringing our hands and start rolling up our sleeves," she said. Pain at the gas pump has become a big issue in the long campaign that started out focusing on the Iraq war. Oil futures reached a record of more than $120 a barrel Monday, raising concerns about even higher prices for gasoline. In a new 30-second ad featuring drivers complaining about the price of filling up, Clinton touted her plan to cut gas taxes over the summer and said Obama was just attacking her idea "because he doesn't have one." "Barack Obama wants you to keep paying, $8 billion in all," an announcer says. "Hillary is the one who gets it." Obama responded with his own spot that said Clinton was offering "more of the same old negative politics." It points out a New York Times editorial that said she's taking "the low road" and that her criticism does "nothing but harm." The ad didn't point out that the same editorial said Obama is contributing to the negative nature of the campaign by "increasingly rising to Mrs. Clinton's bait, undercutting his own claims that he is offering a higher, more inclusive form of politics." Obama said the proposal to suspend the 18.4 cents-a-gallon gasoline tax and the 24.4-cent diesel tax from Memorial Day to Labor Day would provide little in actual savings to motorists. He said oil companies would quickly raise prices to make up the difference. "It's a stunt. It's what Washington does," Obama said in Evansville, Ind. Obama's stance was backed up by 230 economists who released a letter Monday opposing the gas tax holiday. The signers included four Nobel Prize winners and economic advisers to presidents of both parties. And in a CBS News/New York Times poll released Sunday, 49 percent of voters said they thought lifting the gas tax for the summer was a bad idea. Only 45 percent thought it was a good idea. Any belt-tightening didn't extend to the presidential campaigns, with Obama outspending Clinton in both states. By Clinton campaign estimates, Obama has spent $5.6 million in Indiana to Clinton's $3.2 million. In North Carolina, the Clinton campaign said, Obama has spent $4.9 million to Clinton's $3.5 million. Both candidates have had supporters spending money in Indiana as well. The Service Employees International Union, which is backing Obama, spent about $1.1 million in the state, much of it on ads. The American Leadership Project, which has received most of its money from labor groups backing Clinton, spent more than $1 million in ads in Indiana that questioned Obama's economic policies. Obama continued to close Clinton's long-held lead among superdelegates, those party leaders who aren't bound by the outcome of state contests. He picked up two from Maryland Monday, leaving him trailing Clinton 271-257, according to the CBS News count. Clinton's main hope for winning the nomination is to persuade most of the roughly 220 superdelegates still undecided to disregard his lead in the delegate chase and support her instead. The Clinton campaign also hopes to get a boost by getting delegates from Michigan and Florida seated. The Democratic National Committee disqualified those delegates last year because the two states held their primaries too early. Clinton won both contests after all the candidates pledged to boycott the campaigns. The DNC's Rules and Bylaws Committee has scheduled a meeting May 31 to consider seating delegates from the two states. Asked about a report over the weekend in the Huffington Post that the Clinton campaign is encouraging supporters on the committee to reseat the delegations, Clinton spokesman Howard Wolfson said, "If it's a secret that we want the delegations from Florida and Michigan seated, it's the worst kept secret in American politics."